Analog Artist Digital World: Weekend top 6 Picks forSaturday October 3, 2015 and October 4, 2015. Weekend top 6 Picks forSaturday October 3, 2015 and October 4, 2015. 11pm to 1pm. Free. Book Launch Party: Perspective Made Easy by Robbie Lee. Bookmark It 3201 Corrine Drive, Suite 109, Orlando, Florida. What better way to celebrate Florida Bookstore Day than with a Book Launch Party! 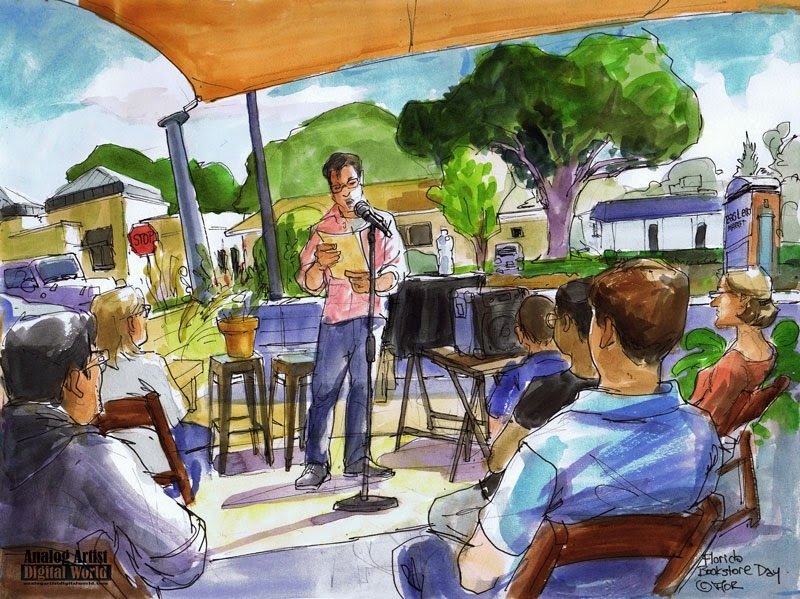 Join local illustrator, beloved art teacher and now AUTHOR, Robbie Lee, on Saturday, October 3 for the launch of his new book "Perspective Made Easy" by Impact Press (2015). Besides giving us a peak into his creative process, Robbie will be leading hands-on drawing demonstrations, so bring your imagination! Delicious treats will be provided by Audubon Park favorites La Femme du Fromage and Bikes, Beans and Bordeaux. Budding artists of all ages welcome! Designed to teach readers of all skill levels how to draw the world around them- everything from cars, rooms, and landscapes to rockets, furniture, and pants- with realistic and convincing depth, Perspective Made Easy's format is a colorful blend of a comic and traditional step-by-step instruction. Plus rumor has, it's pretty dang funny too. 1pm to 4pm Free. Fan Faire 2015. Hart Memorial Central Library, 211 East Dakin Avenue, Kissimmee, Fl. The time has come, geeks one and all, for our yearly Fan Faire! A comic-con celebrating all fandoms. If you love Star Wars, Star Trek, Doctor Who, GoT, OUaT, LOTR, Anime, Manga, Comics, Pixie Hollow, Minecraft, or more, cosplay your best and join the rest! Games, prizes, costume contests, and crafts aplenty. View presentations by experts and shop local artists. 7pm to 9 pm. Free. Functionally Literate presents: Padgett Powell. Celebrate 3 years of Functionally Literate, plus Florida Bookstore Day, and the release of Padgett Powell's latest book: Cries for Help, Various. Readings begin shortly after 7pm and feature: Padgett Powell, Rebbecca Evanhoe & Beth McKee. Beer & wine by donation. Books for sale by Bookmark It Bookstore. Book signing to follow the reading. 3pm to 5 pm. Free. Pine Castle Historical Society quarterly meeting. Pine Castle Woman's Club 5901 South Orange Ave, Orlando FL 32809 (at the corner of Oak Ridge Road).Christie Woods will present on the Mary Ball Washington Museum & Library as a potential vision for our new Pine Castle History Center. Please join us for snacks and root beer floats courtesy of our local A&W!